Spring is here and the weather is starting to warm up! Today’s guest post from Great Aussie Patios has some tips for planning those upcoming Summer Dinner Parties! Warm summer months create an inviting natural atmosphere for dining outdoors. Outdoor patios often take centre stage when entertaining guests in the summertime. There are many things you can do to make your outdoor patio a place that is both comfortable and visually appealing. If you enjoy the outdoors, why not do all of your cooking outside as well? If you enjoy cooking and dining alfresco, creating an outdoor kitchen may be worth the effort. Outdoor kitchens are increasing greatly in popularity. There are many elements involved in creating a successful outdoor kitchen. First, decide on the safest and most appropriate outdoor location for it. Outdoor patios are often the perfect place to create them. Patio designers often install countertop structures made of stone or other sturdy materials. Countertop space is needed in an outdoor kitchen, to provide a place for food preparation. Barbecues can be custom-built by installing them within a stacked stone construction. Many have side burners, which allow the cook to prepare side dishes for the meal. Having an outdoor refrigerator is also useful for storing drinks and food. Having a fancy barbecue island is not essential. As long as you have a barbecue grill and a prep area, a simple outdoor kitchen can be created around these essential elements. Having the right furniture on your outdoor patio is another important element in creating an outdoor kitchen. Before selecting patio furniture, consider how large your summer gatherings are going to be. If you plan on hosting dinner parties for 8, make sure to select a big enough dining table and the appropriate number of chairs. If you plan on hosting small and intimate gatherings, one small table or a few side tables and chairs may be sufficient. Be sure to select furniture that is intended to be used outdoors. Furniture made of iron or a weather-treated wood is an appropriate choice. Farmhouse-style dining tables with wooden benches are a great option for casual family gatherings. Dark wood furniture on outdoor patios gives the space a classic and elegant appeal. If you have an outdoor fireplace, consider yourself lucky. 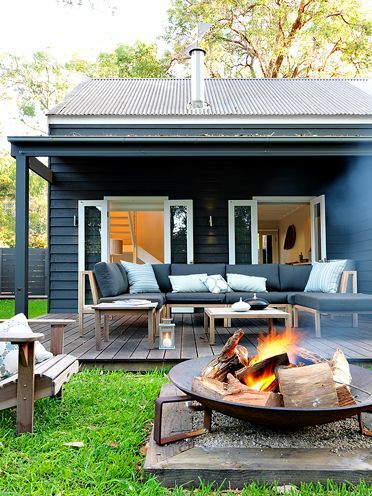 Outdoor fireplaces are perfect for giving your space a feeling of warmth and intimacy. One alternative to an outdoor fireplace is a fire pit. Many fire pits are portable, so they can be moved at will to accommodate your specific patio design. Depending on your design style a chiminea is another appropriate option. Fire pits and chimineas are excellent for guests to warm up after getting out of a swimming pool. Be sure to have a designated area to store and stack wood for cooking and making fires. If the outdoor patio is completely covered, creating shade isn’t much of an issue. Some custom outdoor kitchens are built with pergola structures which create definition in the space and help filter out excessive sunlight. However, if your patio or deck is uncovered, you may want to consider some different options to shade your guests from the hot sun. Portable umbrellas are one of the more popular ways to shade patio areas, as they are positioned above seating areas. Tent structures are a nice option when entertaining a large number of guests in an uncovered patio area. Another option is to purchase portable shading. Portable fabric shades are made in many colours, so finding the right one to fit your design shouldn’t be an issue. Draping fabric shades above dining areas gives the space an elegant and upscale look. Author Bio – Marcus Fulker is managing director of Great Aussie Patios – Perth’s leading patio builders with a solution for every outdoor space.